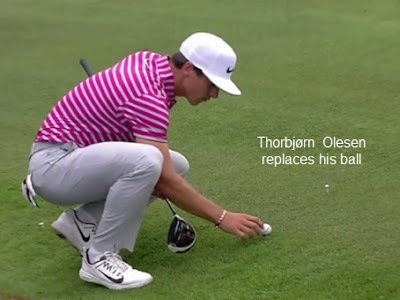 During the second round of the BMW International Open, the Danish Pro, Thorbjørn Olesen, asked for a ruling when his ball placed at rest rolled back into the water whilst he was walking up to the putting green to assess his chip. Subsequently, he criticised; the official that gave him the ruling that he didn’t like, previous officials who he said had given him wrong rulings “so many times this year”, and the Rule itself. The details were that following his second stroke on the 4th hole Olesen’s ball had landed unplayable in water. On taking relief from the hazard he dropped and re-dropped his ball, which on both occasions rolled back inside the hazard. He then tried to place his ball where it had first touched the ground on the second drop, but had trouble trying to place it at rest on the sloping ground. Eventually, after several tries, he did get it to stay at rest and so he removed his hand and walked up to the putting green. The ball then slowly rolled back down the slope, across the hazard margin and into the water. Apparently, a Rules official who had witnessed the placing wrongly thought that the ball could be replaced where it was without penalty, but this was subsequently corrected by European Tour Senior Referee, Andy McFee. The ball should obviously have been dropped again under Rule 26, for a second penalty stroke, but the fact that the official had advised Olesen that he could place the ball meant that he avoided the penalty of two strokes for placing a ball instead of dropping it. At the time of writing there are three separate videos on this incident on the same web page at this Golf Channel link; 1. Olesen explaining the incident to Andy McFee, with a replay of the incident with commentary, which for a change was spot on, 2. Olesen describing the incident and his problem with it, and 3. Andy McFee explaining the ruling. Has your Club/Society introduced the Local Rule relating to accidentally moving a ball or ball marker on the putting green? If not, why not? Both the R&A and USGA have recommended that all competitions should now be played with this recommended Local Rule operating. See this blog of mine for more detail. Remarkably, it seems that despite the extensive media coverage on this issue, at least one professional golfer who earns their living from the sport, did not take it in and presumably did not bother to read the Local Rules pertaining to the WGC Match Play tournament last April at Austin, Texas. The circumstance of the incident was that following the first round group matches, Englishman, Tyrrell Hatton, was in a play-off against Spaniard, Rafa Cabrera Bello, and American, Charles Howell III, to see which of them was going through to the next round. As Hatton was lining up his short par putt on the first hole of the playoff he accidentally moved his ball. Wrongly assuming that he had incurred a penalty, he tapped his ball into the hole and walked off the putting green leaving the others to complete the hole and the playoff. Had he known, or remembered, the new Local Rule, or consulted with a Rules official, he would have realised that he should have replaced his ball where it was before he accidentally caused it to move, without incurring any penalty. If you ever have a reason to research when a particular Rule of Golf was introduced, amended, or developed, I recommend the ‘Historical Rules of Golf’ web site at this link. Kudos to John Hutchinson and all those that assisted him with their contributions to this excellent resource. Eliminating the chore of composing suitable questions. Ensuring all answers are correct and not open to dispute. Providing the appropriate Rules references. Supplying helpful explanations, where necessary. Including a handy check sheet for fast and accurate marking of answer sheets. Looking at the 3 videos it seems to me that Olesen did not act in accordance with Rule 26-1.b, in that he did not "Drop a ball behind the water hazard, keeping the point at which the original ball last crossed the margin of the water hazard directly between the hole and the spot on which the ball is dropped…"
He obviously dropped the ball nearer to the hole! As in the Andy McFee explanation, Olesen was taking relief under Rule 26-1c and not 26-1b. Obviously, the player the referee and McFee all thought that he was able to drop/place a ball not nearer the hole than where it last crossed the margin of the lateral water hazard; it is impossible to make that judgement from a video. I was interested in the number of times he tried to keep the ball at rest. He doesn't really understand the spot can be a few feet away (NNTH)as per 20-3d. Maybe that was when he should have called the ref over. Great suggestion. I would pay to see that; though I would not include Tiger, as in my opinion he knows how to 'use the Rules' to his advantage. Not really applicable to this case, but I know a ball is in play as soon as it is at rest. The question is how long does the ball need to stay put to be considered at rest? For example, if Olesen's ball had started moving a second or two after he placed it could it truly be considered to be at rest? There is nothing in the Rules/Decisions that clarifies how long a ball that has been dropped or placed has to be at rest before it is in play. Most experienced players will hover their hand above the ball until they are certain that it is at rest; if they see it oscillating or moving fractionally, they try again. This was (one of!) Olesen's mistake, he claimed that he saw his ball moving after he had placed it, but still walked away. One of the reasons for my interest is we have a few two tier greens on my home course and quite often balls plug on the slope between tiers. The tiers are at significantly different levels. If the pin is on the lower tier, it is advantageous to claim a replaced ball was at rest momentarily before it rolled down the slope towards the pin and then play from where it subsequently comes to rest at no penalty. If the pin is on the upper tier this works against you, in which case it is better to claim your ball wont come to rest and then find the nearest point it will come to rest - often this will be on the side of the upper tier. A third option is to repair your plug mark in such a way that the ball will stay at rest on it, mid slope - again a bit dubious? So the point is, some players will manipulate this to their benefit and others will take the worst case scenario and there doesn't seem to be any specific rule to cover it? It all depends on the character of player involved, which does not seem equitable! In the circumstance that you describe a ball is at rest if it does not move off the spot where it has been placed when the fingers are removed. If it is perceptably moving after this action it is not at rest and the player must return it to where it was originally marked. If it moves a second or so after it has been seen to have been at rest then the player must play it from where it comes to rest. Anyone who purposely repairs their ball mark so that a ball will rest on it and not roll away from the hole incurs the general penalty, in the same way as if they press their ball into the surface, as in Decision 1-2/9. I do not see any need for any other Rule to deal with these situations. Your assertion that a player who purposely repairs their ball mark so that the ball will stay on it (first repair only) is incorrect. It is not a breach of Rule 1-2, as there is no requirement to perfectly repair the ball mark, nor no definition of a "perfect repair". However, changing the repair after the ball will not come to rest would be a breach of Rule 1-2. I disagree. I would penalise a player for the action that you describe as to me it is clear that this would intentionally be taking an action to influence the movement of a ball in play and to alter physical conditions that affect the playing of the hole, in breach of Rule 1-2. I disagree with your interpretation. The Rules do not say how well a ball mark must be repaired, only that it can be, ie, they permit the player to "alter the conditions". Presumably, the ball has been marked and lifted, so it's not in play, nor is it moving.